The safety seat Storchenmühle Solar 2 Seatfix features every safety functions of its predecessor Storchenmühle Solar Seatfix. Its 11 position adjustable headrest allows for the optimal size of the seat. Its ventilation and padding keeps the child comfortable even on loger rides. 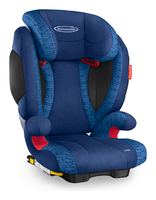 The advanced side protection (ASP) offers a good side impact protection with the car seats fixed arm rests and the additional padding around the hip and head of the small passenger. The Seatfix connectors offer additional safety and stability. 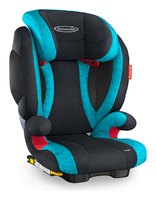 This car seat is usable with the cars ISOFIX connectors or with the car's 3-point-belt.